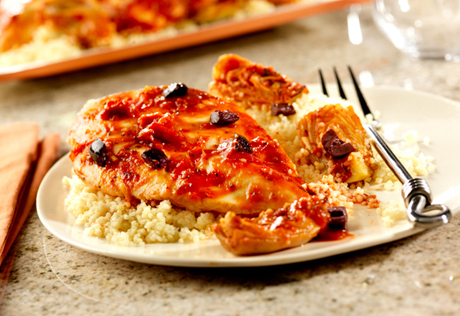 Chicken and artichokes are roasted with a squeeze of lemon and a fresh-tasting Italian sauce and served over a bed of couscous. Yep, it's as good as it sounds. Heat the oven to 400°F. Grate 1 teaspoon zest and squeeze 1 tablespoon juice from the lemon. Place the chicken and artichoke hearts into a roasting pan. Stir the sauce, lemon juice and lemon zest in a medium bowl. Pour the sauce mixture over the chicken and artichoke hearts. Roast for 35 minutes or until the chicken is cooked through. Serve the chicken and sauce over the couscous. Serving Suggestion: Try sprinkling the finished dish with some chopped pitted Kalamata olives. This is one of the best! I added Parmesan cheese grated on top. I will make this again! The flavor of the sauce was way too strong. It needs to be cut with cream cheese or something. My husband said it was nothing special and I agree. It was really just chicken and sauce. It's a quick dinner and it tastes great.